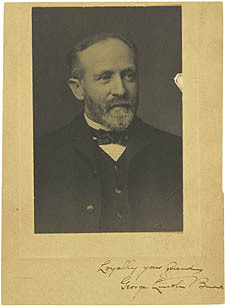 George Lincoln Burr first met Andrew Dickson White in the classroom when he entered Cornell in 1877. White was impressed by Burr, and soon hired him to take care of his growing personal Library. After 1879, the White collection became the product of a partnership between White and his talented librarian. Each traveled to Europe on extended book-buying trips, and both had an astute eye for valuable and uncommon books. Burr did more than anyone to influence the range and texture of White’s historical collection, and became expert in two of its subjects—the Protestant Reformation, and witchcraft. Photograph of George Lincoln Burr, ca. 1890. University Archives.